Eli Case was born on 2 May 1741 at West Simsbury, Hartford Co., CT. He was the son of Sgt. Richard Case and Mercy Holcombe. Eli Case married Athilred Reed. Eli Case died on 26 March 1804 at West Simsbury, Hartford Co., CT, at age 62. [S101] Ruth Cost Duncan, John Case, Page 31/Item 55. [S65] Deanna Holcomb Bowman Thomas Holcomb, Vol. I:Pg. 133/Item 4575. Capt. Uriah Case was born on 16 January 1743/44 at West Simsbury, Hartford Co., CT. He was the son of Sgt. Richard Case and Mercy Holcombe. Capt. Uriah Case married Susannah Lawrence, daughter of Lt. Samuel Lawrence, on 21 March 1765 at Simsbury, Hartford Co., CT. Capt. Uriah Case married Eunice Dill, daughter of Solomon Dill, circa 1777. Capt. Uriah Case married Mary Case, daughter of Capt. John Case and Sarah Barber, on 27 December 1815. Capt. Uriah Case died on 23 December 1826 at "Missing Place" no. 5983 at age 82. Ruth Cost Duncan cites the Simsbury Vital Records, and the Canton Congregational Church Records. [S101] Ruth Cost Duncan, John Case, Page 32/Item 56. [S65] Deanna Holcomb Bowman Thomas Holcomb, Vol. I:Pg. 133/Item 4576. [S25] Hannah McPherson, Holcombe Genealogy, Page 82.1/Item A-4-5-8-6. Edward Case was born on 15 April 1748 at West Simsbury, Hartford Co., CT. He was the son of Sgt. Richard Case and Mercy Holcombe. Edward Case married Zervah Lawrence, daughter of Lt. Samuel Lawrence, circa 1774. Edward Case died on 2 December 1822 at age 74. [S101] Ruth Cost Duncan, John Case, Page 33/Item 57. [S104] DAR DAR Lineage book, Vol. 9:Pg. 131/Member 8340 as viewed at ancestry.com. Phineas Case was born on 8 March 1749/50 at West Simsbury, Hartford Co., CT. He was the son of Sgt. Richard Case and Mercy Holcombe. Phineas Case married Sarah Tuller, daughter of Elijah Tuller and Sarah Case, in May 1780. Phineas Case died on 19 July 1798 at West Simsbury, Hartford Co., CT, at age 48. [S101] Ruth Cost Duncan, John Case, Page 33/Item 58. Mercy Case was born on 2 June 1752 at West Simsbury, Hartford Co., CT. She was the daughter of Sgt. Richard Case and Mercy Holcombe. Mercy Case married Abraham Moses, son of Caleb Moses and Mary Adams. Mercy Case died on 22 May 1818 at West Simsbury, Hartford Co., CT, at age 65. [S101] Ruth Cost Duncan, John Case, Page 13. Naomi Case was born on 30 October 1755 at West Simsbury, Hartford Co., CT. She was the daughter of Sgt. Richard Case and Mercy Holcombe. Naomi Case married David Pettibone, son of Jacob Pettibone and Jemima Cornish. Naomi Case died in 1822. [S101] Ruth Cost Duncan, John Case, Page 33, Item 59. [S45] Albert C. Bates, Simsbury, Page 119. [S418] Ruth Cost Duncan, John Case 2nd Edition, Page 30. Asahel Holcombe III was born on 28 August 1764 at Simsbury, Hartford Co., CT.4 He was the son of Asahel Holcombe Esquire and Sarah Eno. Asahel Holcombe III was MLT INDUCTION on 26 December 1780 at Sheldon's Dragoons. He married Patty (Martha) Flagg, daughter of Abijah Flagg and Sarah Clark, on 6 June 1788. Asahel Holcombe III died on 30 March 1830 at age 65. Upon the memorial of Asahel Holcomb Jr. Shewing to this assembly that his son Asahel Holcomb 3rd was sentenced & committed to Newgate Prison for the term of two years for the crime of forgery & was taxed with a bill of cost to the amount of $56.67 and altho he acknowledges the sentence was just yet he says that sd Asahel 3rd had no intention of committing any fraud on any person as he verily believes and altho he had contractd habits of ileness & dissipation preventd him fro acquiring any property, yet your Memorialist entertained hopes that his son by suffering sd punishment would tereby become reformed and that during hsi confinement he paid several sums for the support of his family and at the expiratin of the term for which his son was snetenced he was induced from parental feeling to engage one othr of his sons viz Luther Holcomb, sd Asahel 3rd being very poor, his note for sd bill of cost as pr memorial on file. Resolved by this assembly that sd sum as aforesaid be & the same is remitted by the overseer of sd Newgate Prison. [S25] Hannah McPherson, Holcombe Genealogy, Page 214.2/Item A-8-4-9-1-1. [S65] Deanna Holcomb Bowman Thomas Holcomb, Vol. I:Pg. 166/Item 84811. [S45] Albert C. Bates, Simsbury, Page 227. Sarah Holcombe was born on 17 October 1766 at Simsbury, Hartford Co., CT.1 She was the daughter of Asahel Holcombe Esquire and Sarah Eno. Sarah Holcombe married Reuben Barker. Reuben Barker married Sarah Holcombe, daughter of Asahel Holcombe Esquire and Sarah Eno. [S25] Hannah McPherson, Holcombe Genealogy, Page 215.1/Item A-8-4-9-1-3. [S65] Deanna Holcomb Bowman Thomas Holcomb, Vol. I:Pg 166/Item 84813. [S377] Coralee Griswold Griswold 6 & 7 Vol 1, Page 77. Served in East Granby as town and township clerk and on school committees. Carol Laun cites the Simsbury Vital Records, pages 68, 217, 227; East Granby Vital Records, pages 95, 98, 129; East Granby Church Records, pages 34, 47, 123; the Alderman Genealogy; the Episcopal Church Records, page 57; and "The Report, Oct 1968, OH Genealogical Society" - all viewable at the Salmon Brook Historical Society in Granby of which she is Curator. Luther Holcombe was born on 27 April 1774 at Simsbury, Hartford Co., CT.4 He was the son of Asahel Holcombe Esquire and Sarah Eno. Luther Holcombe married Suzannah Holcombe. Luther Holcombe died on 2 February 1809 at age 34. [S25] Hannah McPherson, Holcombe Genealogy, Page 215.2/Item A-8-4-9-1-4. [S60] Deanna Holcomb Bowman, Thomas Holcomb, Vol. I:Pg 75/Item 8482 and page 166/Item 84814. [S104] DAR DAR Lineage book, Vol XCVIII:Pg. 272/Item 97875. Calvin Holcombe was the son of Asahel Holcombe Esquire and Sarah Eno. Calvin Holcombe married Eleanor Thrall. Calvin is mentioned in his father's will, but no other data. Bowman notes that he is not mentioned in Simsbury Soldiers or Simsbury records. [S25] Hannah McPherson, Holcombe Genealogy, Page 216.1/Item A-8-4-9-1-5. [S65] Deanna Holcomb Bowman Thomas Holcomb, Vol. I:Pg 166/Item 84815. Mary Holcombe was born on 6 April 1749 at Simsbury, Hartford Co., CT.1 She was the daughter of John Holcombe and Mary Kent. Mary Holcombe married Thomas Copley IV on 11 July 1774 at Granby, Hartford Co., CT.
Seaver does not mention this child, only (and 5 other dau). Bowman lists two Mary's with different birth/death dates. [S45] Albert C. Bates, Simsbury, Page 196. [S65] Deanna Holcomb Bowman Thomas Holcomb, Vol.I:Pg. 74/Item 843/. Noah moved with his father, John, from Granby, CT to Dorset, Bennington Co., VT, in 1775, where he is recorded in the 1790 Cnesus with family having males, 3 and females 3; became one of a large group of incorporators to whom was granted June 26, 1782 a charter for the town of Albany, Orleans Co., VT.
Noah was enumerated in the 1800 Rupert, Bennington Co., VT, federal census, next to Laomi. Noah was enumerated in the 1810 Bristol, Addison Co., VT, federal census with family of males: 1 16-25, 1 45 and over; females 1 45 and over. Noah Jr. was enumerated next door. Noah was enumerated in the 1820 Harrisville, Medina Co., OH, federal census. The household consisted of males: 45 and over 1; females 26-45 1, 45 and over 1. There is a lot of confusion about the wifes and children of Noah. McPherson shows a second wife Sarah who bore Noah II. Seaver shows the second wife to be Tirfene Young, but Bowman thinks Trifene married a different Noah. Simsbury BMD records are specific, naming both Noah and Jerusha as parents of Noah and Jerusha. [S65] Deanna Holcomb Bowman Thomas Holcomb, Vol. I:Pg. 166/Item 8433. [S25] Hannah McPherson, Holcombe Genealogy, Page 211.2/Item A-8-4-4-6. Jerusha Buttolph was born on 11 January 1753. She was the daughter of Capt. Jonathan Buttolph and Jerusha Dibble. Jerusha Buttolph married Noah Holcombe, son of John Holcombe and Mary Kent, in 1771. Moses Holcombe was born on 12 September 1753 at Simsbury, Hartford Co., CT.1 He was the son of John Holcombe and Mary Kent. Mariam Holcombe was born on 25 May 1760 at Simsbury, Hartford Co., CT.1 She was the daughter of John Holcombe and Mary Kent. Deacon Asahel Holcombe was born on 15 July 1720 at Simsbury, Hartford Co., CT. He was the son of Ensign John Holcombe and Ann Pettibone. Deacon Asahel Holcombe married Thankful Kent, daughter of John Kent and Mary Smith, on 7 January 1741/42 at Simsbury, Hartford Co., CT.3 Deacon Asahel Holcombe married Dinah Kent on 11 June 1747. 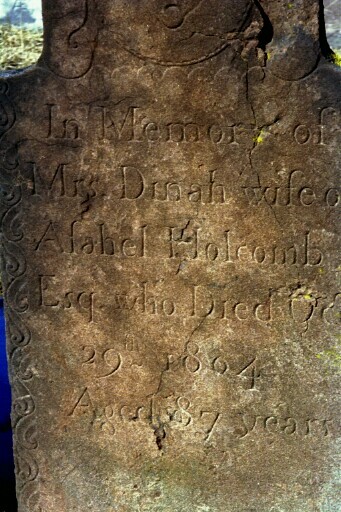 Deacon Asahel Holcombe died on 22 February 1817 at Turkey Hills, Hartford Co., CT, at age 96. McCracken says little about Asahel, Seaver gives many following generations. 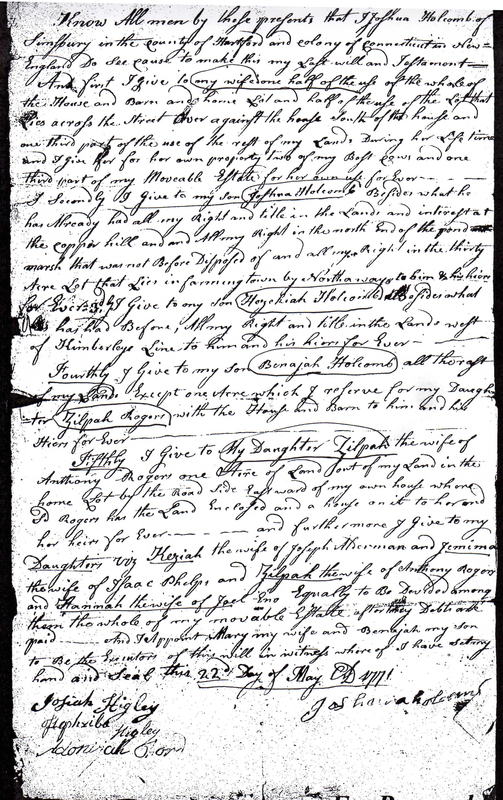 From the Simsbury, Connecticut Probate Records, Volume 1, 1769-1780 abstracted by Helen Schatvet Ullmann, in the Connecticut Nutmegger July 2016: Page 543, 16 February 1781, Asahel Holcomb took guardianshio if Eunice Granger, a minor of 12 years of age. [S104] DAR DAR Lineage book, Vol. XCVIII:Pg 272/Item 97875; Vol. CXX/Item 119003. [S25] Hannah McPherson, Holcombe Genealogy, Page 214.1/Item A-8-4-9. [S45] Albert C. Bates, Simsbury, Page 94. [S45] Albert C. Bates, Simsbury, Page 75. Dinah Kent was born in 1717. She married Deacon Asahel Holcombe, son of Ensign John Holcombe and Ann Pettibone, on 11 June 1747. Dinah Kent died on 29 October 1804. She was buried at East Granby Cemetery, East Granby, Hartford Co., CT.
Ahas Holcombe was also known as Ahaz Holcombe. He was born in 1745. He was the son of Deacon Asahel Holcombe and Thankful Kent. Ahas Holcombe married Hannah Stevens. Ahas Holcombe died on 17 July 1813. Seaver lists this child, but Bowman shows Amaziah and Ahaz as the same person, citing Simsbury records. McCracken only lists Amaziah. "Dec 18 1777 Ahaz Holcomb upon a confession for Stealing & disobedience to Parents was received into Charity." TEN DOLLARS REWARD Deserted form the garrison at West Point the 23d inst. Samuel Holcomb and Elihu Holcomb, corporals in the Corps of Artillerists and Engineers; the former 5 feet 10 inches high, light hair and light complexion, 19 years of age; the latter 5 feet 8 inches high, light brown hair and light complexion, 23 years of age; they had on when deserted short blue coats with white facings, and white dimity overralls and vests; they were born in the town of Granby, near Simsbury, State of Connecticut where they last lived and their parents now reside. Whoever shall apprehend or cause to be apprehended, secure or cause to be secured the said deserters in any of the goals of the neighboring states, shall recieve Ten Dollars reward adn the reasonable expences paid. [S23] Jesse Seaver, The Holcomb(e) Genealogy, Page 47:Item 211.1. [S65] Deanna Holcomb Bowman Thomas Holcomb, Vol.I:Pg.166-167. [S25] Hannah McPherson, Holcombe Genealogy, Page 216.2/Item A-8-4-9-3. Hannah Stevens was born in 1746. She married Ahas Holcombe, son of Deacon Asahel Holcombe and Thankful Kent. Hannah Stevens died on 30 December 1826. McCracken spells this name Amaziah; Seaver also questions the birth date also giving 1746. Died young. Spear in Search for the Passengers of the Mary and John lists Ahaz as a separate child. Amasiah Holcombe was born on 6 February 1745 at Simsbury, Hartford Co., CT.2 He was the son of Deacon Asahel Holcombe and Thankful Kent. [S23] Jesse Seaver, The Holcomb(e) Genealogy, Page 48. [S45] Albert C. Bates, Simsbury, Pages 81 and 84. Ruth Holcombe was born on 26 August 1750 at Simsbury, Hartford Co., CT.1 She was the daughter of Deacon Asahel Holcombe and Dinah Kent. [S45] Albert C. Bates, Simsbury, Page 43. [S777] Barbara Jean Mathews, Gov. Thomas Welles, Vol 1, 2nd Ed., page 334. [S777] Barbara Jean Mathews, Gov. Thomas Welles, Vol. 2, Part A, page 198. [S777] Barbara Jean Mathews, Gov. Thomas Welles, Vol. 2, Part A, page 199. Norman Ingham of Granby, MA, has compiled a lenghty genealogy of Ichabod, but only briefly discusses Sarah Holcombe and does not resolve the question of her parents. McPherson, page 211.2 6 shows her as a daughter of John and Ann (Pettibone) Holcombe and gives a birth date of 2 May 1716; and on page 214.1 lists a marriage to Ichabod Miller on 27 January 1741, and her death in 1800. McPherson provides no additional information. Seaver, page 42 7 shows her as a daughter of John and Ann (Pettibone) Holcombe and gives a birth date of 2 May 1716, a marriage to Ichabod Miller on 27 January 1741, and death in 1800. Bowman, page 28, 8 shows her as a daughter of John and Ann (Pettibone) Holcombe and gives a birth date of 1719, a marriage to Ichabod Miller in 1741, and death in 1800. Bowman continues the line on page 74 and shows 9 chldren. McCracken, page 167, 9 shows her as a daughter of John and Ann (Pettibone) Holcombe and gives a birth date of 2 May 1719. He does not list any additional information. McPherson, page 30.2 6 does not list a daughter Sarah. Seaver, on page 11, 7 does not list Sarah as a daughter of Thomas and Mary, but rather lists her as a daughter of Thomas' father Thomas and his second wife Rebecca Pettibone, and gives a birth date of 5 September 1719. Bowman, on page 51, 8 lists Sarah, born 1719, married to Ichabod in 1741, and died in 1800 and references Sarah, the daughter of John and Ann. Bowman does not continue this line. McCracken, on page 73, 9 lists Sarah, born 5 September 1719. He provides no further information on her. The Connecticut Nutmegger, Volume 28, No. 2, page 206, in an article titled "The Spencers and other men of Suffield, Connecticut, who served in the French & Indian War - 1755 - 1760", authors Jack T. Spencer and Edith W. Spencer, mention the marriage of William Spencer and Sarah Holcombe without any additional details or sources. A contrary marriage for Sarah to William Spencer is listed in TAG Vol. 28, page 128. It shows that William, son of William, born Suffield say 1716, died there about Dec. 1771, will 4 Dec. 1771, proved 6 Jan. 1772; married (intention 28 Aug. 1736), Sarah Holcomb of Simsbury, quite likely the Sarah born there 2 May 1719, daughter of John and Ann (Pettibone) Holcomb; she died before 21 Oct. 1795, when the heirs signed an agreement. [S65] Deanna Holcomb Bowman Thomas Holcomb, Vol. I:Pg. 28, 74/Item 847. [S25] Hannah McPherson, Holcombe Genealogy, Page 214.1/Item A-8-4-6. [S60] Deanna Holcomb Bowman, Thomas Holcomb. [S25] Hannah McPherson, Holcombe Genealogy, Page 44/Item A-4-5-1. [S45] Albert C. Bates, Simsbury, Page 13. [S45] Albert C. Bates, Simsbury, Page 125. Ephraim Griffin was the son of John Griffin. Ephraim Griffin married Elizabeth Adams, daughter of Samuel Adams, before 1725. Robert Hoskins was born on 6 June 1662. He was the son of Anthony Hoskins and Isabel Brown. Robert Hoskins married Mary Gillett on 27 October 1686. Robert Hoskins died on 8 November 1729 at Simsbury, Hartford Co., CT, at age 67. [S52] Henry R. Stiles History of Ancient Windsor II, Vol. II/Pg. 405-6. Mary Gillett was born in 1668. She married Robert Hoskins, son of Anthony Hoskins and Isabel Brown, on 27 October 1686. Anthony Hoskins was born circa 1632 at Dorchester, Suffolk Co., MA. He was the son of John Hoskins and Ann Filer. [S52] Henry R. Stiles History of Ancient Windsor II, Vol. II:Pg. 404. Joshua Holcombe III was born on 18 September 1697 at Simsbury, Hartford Co., CT.6,7,8 He was the son of Ensign Joshua Holcombe and Hannah Carrington.7 Joshua Holcombe III was baptized on 17 April 1698 at Simsbury, Hartford Co., CT.9,10 He married Marey Griffin, daughter of Thomas Griffin and Elizabeth Welton, on 28 October 1720 at Simsbury, Hartford Co., CT.11 Joshua Holcombe III left a will on 22 May 1771 at Hartford Co., CT. He died in November 1772 at Simsbury, Hartford Co., CT, at age 75.12,13 His estate was probated in 1773 at Hartford Co., CT.
[S23] Jesse Seaver, The Holcomb(e) Genealogy, Page 15. [S65] Deanna Holcomb Bowman Thomas Holcomb, Vol. I:Pg 57. [S25] Hannah McPherson, Holcombe Genealogy, Page 44.2/Item A-4-5-2. Named in father's will as daughter of Hannah. Seaver shows her marrying Joseph Barnes on 5-12-1700, which seems unlikely. McCracken has her born circa 1702-04, while Seaver has her born 1707. McCracken further says birth not found but mentioned in father's will as daughter of Hannah. Experience Holcombe was born in 1702 at Simsbury, Hartford Co., CT.1 She was the daughter of Ensign Joshua Holcombe and Hannah Carrington.1 Experience Holcombe married Nathaniel Alford, son of Josiah Alford and Hannah Westover, on 3 July 1724 at Simsbury, Hartford Co., CT.2 Experience Holcombe died on 15 December 1774 at Simsbury, Hartford Co., CT.
[S45] Albert C. Bates, Simsbury, Page 151. Children are listed in Simsbury Soldiers and Bates. Nathaniel Alford was born in 1698. He was the son of Josiah Alford and Hannah Westover. Nathaniel Alford married Experience Holcombe, daughter of Ensign Joshua Holcombe and Hannah Carrington, on 3 July 1724 at Simsbury, Hartford Co., CT.2 Nathaniel Alford died in 1769. [S65] Deanna Holcomb Bowman Thomas Holcomb, Vol. I:Pg. 58. McCracken states that birth not found; named in father's will as daughter of Hannah, birth circa 1704-05; Seaver gives birth twice as 1710. McCracken in NEHGS says 1710. McCracken notes (TAG 1981) that spouse is John Reade, not John Reuel as stated in the Hayes Genealogy. Bowman spells it Read in one place, Reed in another. Most of the evidence indicates the Hannah that married John Reade is the daughter of Nathaniel Holcombe and wife Thankful Hayes. Hannah Holcombe was born in 1711. She was the daughter of Ensign Joshua Holcombe and Hannah Carrington. McCracken: Woodbridge's record, as well as her father's will, calls her daughter of Hannah. [S65] Deanna Holcomb Bowman Thomas Holcomb, Vol. I:Pg. 57/Item 454. Julia Dewey married Elam Messenger, son of Lemuel Messenger and Abigail Lampson. Matthew Holcombe was born on 7 May 1708 at Simsbury, Hartford Co., CT.4,5 He was the son of Ensign Joshua Holcombe and Hannah Carrington.4 Matthew Holcombe was baptized on 16 May 1708 at Simsbury, Hartford Co., CT.6 He married Lois Drake, daughter of Enoch Drake and Elizabeth Barber, on 20 January 1729/30 at Windsor, Hartford Co., CT.7 Matthew Holcombe and Lois Drake were divorced in 1744.8 Matthew Holcombe married Lydia Porter. Matthew Holcombe died on 21 March 1781 at age 72. McCracken notes that Stiles was unable to place him (2:396), but did find, in a Windsor record, that he married. Bowman notes: Matthew must have married again having Lydia born in Feb. 1744 and several other children listed in Stiles. In Matthew's 1777 will he wrote "First being pentinent and sorry from the bottom of my heart for my past sins." He left all property to Isaac Phelps. They had children listed in Stiles, the Drake Genealogy and Windsor Records. [S23] Jesse Seaver, The Holcomb(e) Genealogy, Page 12. [S65] Deanna Holcomb Bowman Thomas Holcomb, Vol.I:Pg.58. [S194] C.G. Margaret Harris Stover, "Marriage Extractions." McCracken notes that he was called 2nd in Simsbury Records, that is, he was younger than a first cousin who was b 1696. Seaver shows the second marriage about 1761, so the 18 children listed here are divided about that date. McCracken does not list a second wife at all nor comment on Seaver. A David Holcomb married Phillina Hollenback in 1761, Seaver says it was the second marriage of David Holcombe. This is impossible since his first wife Sarah died in january 1762, see Canaan Records, and David and Phillina had a child Anna born in 1760. Bowman places Phillina as the wife of son David (1737-1776). Their children are listed under them separately. Canaan, Ct., records contain the birth dates of many of the following children, and Simsbury records contain the births of the first five. [S23] Jesse Seaver, The Holcomb(e) Genealogy, Page 13-14. [S25] Hannah McPherson, Holcombe Genealogy, Page 71.1/Item A-4-5-7. [S65] Deanna Holcomb Bowman Thomas Holcomb, Vol. I:Pg. 59/Item 458. [S25] Hannah McPherson, Holcombe Genealogy, page 71.1.